Anders Fogh Rasmussen, NATO Secretary General, has underlined President Barack Obama’s warning to the Syrian government not to use chemical weapons against its own people. 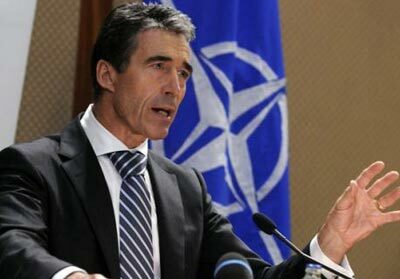 At a NATO foreign ministers’ meeting in Brussels, Anders Fogh Rasmussen said their use would be “completely unacceptable”. The foreign ministers are expected to approve the deployment of Patriot anti-missile batteries to Turkey. The move is designed to defend Turkey’s border with Syria. Activists say more than 40,000 people have been killed since the Syrian uprising against President Assad began in March 2011. Hundreds of thousands of people have fled the country and another 2.5 million are displaced within its borders. On Tuesday, a teacher and at least 28 students were killed in a rocket attack on their school inside the Wafideen refugee camp, 20 km (15 miles) north-east of Damascus. The origin of the firing was not clear – state media said it had been a rebel mortar attack. Speaking ahead of the NATO meeting, Anders Fogh Rasmussen told reporters: “The possible use of chemical weapons would be completely unacceptable for the whole international community. The meeting of the 28-member Western military alliance’s foreign ministers in Brussels follows a request from Turkey to boost its defences along the border. NATO officials have made clear such a move would be purely defensive. Barack Obama has warned Syrian President Bashar al-Assad he would face “consequences” if he used chemical weapons against his people. “The world is watching. The use of chemical weapons is and would be totally unacceptable,” said Barack Obama in a speech at the National Defense University in Washington. A Syrian official has insisted the country would “never, under any circumstances” use such weapons, “if such weapons exist”. A NATO team has already visited a number of sites in Turkey in preparation for the deployment of Patriot batteries, which could be used to shoot down any Syrian missiles or warplanes that stray over the border. The missile deployment is likely to be approved despite opposition from Russia, whose foreign minister is also attending Tuesday’s meeting in Brussels. But analysts say any deployment – possibly supplied by the US, Germany or the Netherlands – could take weeks. Syrian opposition fighters have reportedly made dramatic gains recently, and several government mortar shells – aimed at rebel targets close to the border – have landed across its 900-km (560-mile) border with Turkey. Ankara’s request for NATO to deploy the anti-missile batteries came after intelligence assessments that Damascus was contemplating using ballistic missiles, potentially armed with chemical warheads, reports say. The CIA has said those weapons “can be delivered by aircraft, ballistic missile and artillery rockets”. One unnamed US official told the New York Times on Monday that the level of concern in Washington was such that contingency plans were being prepared. On Monday the United Nations said it was pulling “all non-essential international staff” out of Syria, with as many as 25 out of 100 international staff expected to leave this week. The European Union has withdrawn its mission altogether. The ambassador and head of delegation to Syria, Vassilis Bontosoglou, left Damascus with his six remaining international staff members on Tuesday morning. Although the head of the Arab League Nabil al-Arabi told AFP on Monday that the Syrian government could fall “any time”, it still holds the capital, parts of the second city Aleppo, and other centres. Syrian foreign ministry spokesman Jihad Makdissi is said to have fled the country, amid reports he has been dismissed, ostensibly for making statements out of line with government policy.